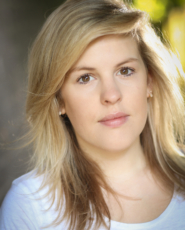 Bryony is an actor, character comedian and writer who trained at the Guildford School of Acting. Bryony has recently filmed a role on Season 4 of The Royals on Channel ‘E’! She can also be seen on the latest EE commercial starring Kevin Bacon. In 2018 Bryony, having recently performed at the Vaults Festival, performed her debut solo show Bryony Twydle: Flamingo at the Underbelly, as part of the Edinburgh Fringe Festival. Previously Bryony was a Funny Women Semi Finalist and a Leicester Square New Comedian of the Year Semi Finalist, she also performs as part of sketch group The Jest. The Jest have featured on BBC Radio 4’s Sketchorama and Sketchorama Extra as well as winning the Leicester Square Theatre Sketch Off Competition in 2016. Bryony is a graduate of the Soho Comedy Lab, she also runs a regular sketch and character night at the Camden Comedy Club every last Wednesday of the month. Details of her upcoming gigs can be found on her website.